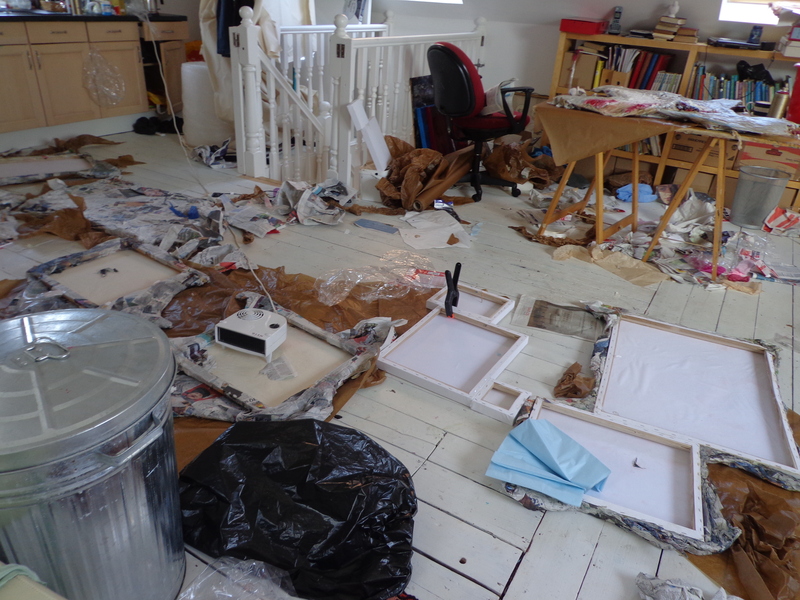 Back when I was doing my MA, I promised myself that when I finished, I would really clean the studio. 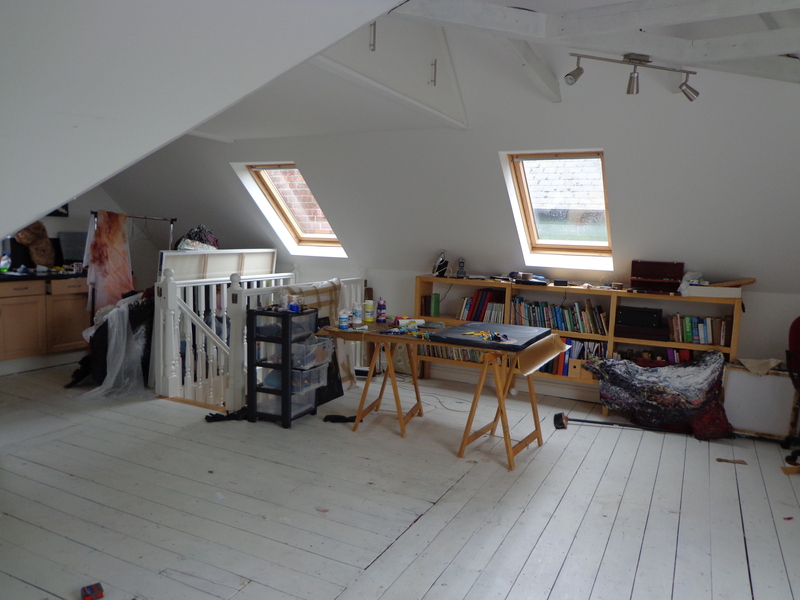 It’s not that over the past two and a half years I never tidied it up – just not very much. Then I was away for the summer and over the past ten days I have been really trying to get to grips with it, These are some of things I have learnt. Gravity applies to paint. This means that paint that starts as interesting runnels on a canvas ends up on the floor. It also end up on the tops of shoes. Paint, like dog poo, is attracted to the bottom of shoes; that is why there are little patches of. paint across the floor and down the attic stairs. Paradoxically, paint can also defy the powers of gravity and can travel horizontally and even vertically; that is why there is paint on the walls. 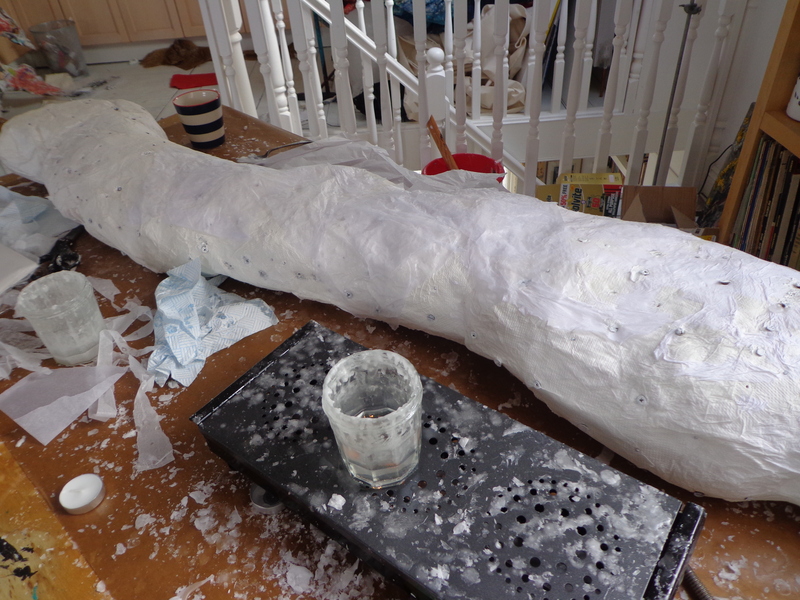 Glue, resin, insulating foam, varnish and wax all have the same travelling properties as paint, only more so. Newspaper and tissue paper are among the inanimate object that appear to have a desire to be art; in their case they would like to be a collage on the floor; that is why they take every opportunity to become attached to any paint, glue, resin, wax, insulating foam etc that they can find. 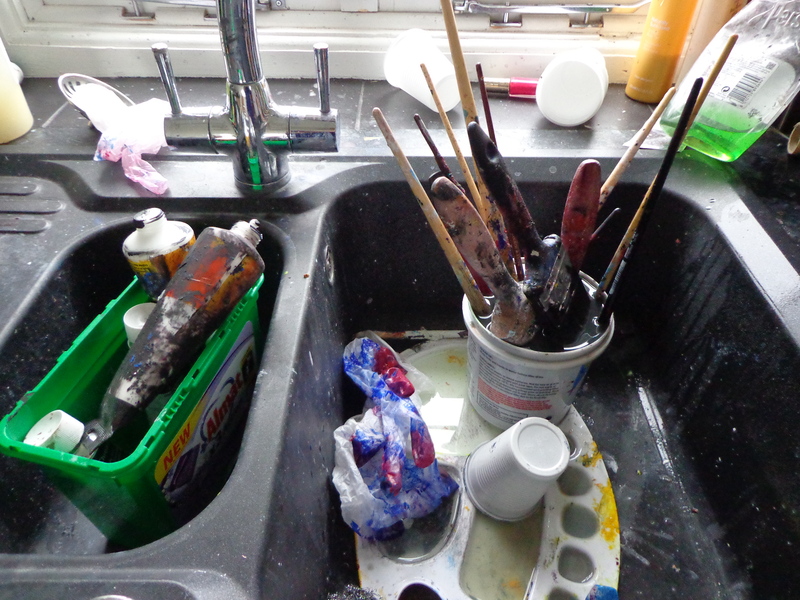 Paint brushes do not improve for soaking for six months particularly if the water or white spirit has evaporated. Maybe they just need longer. Three tins of red gloss paint is plenty. If you find a the top of a paint tube it never matches any of the tubes without tops. A brush wrapped in clingfoil does not stay usable forever. You do not find more things after tidying the studio: just different things. whether you can tip brush restorer down the sink. The label on the bottle says ‘do not put it in plastic containers’: presumably it dissolves them.The waste pipes are plastic and I have visions of painty brush restorer cascading through the house a bit like the acid in the bath scene in Breaking Bad. Oh well, maybe it will do the brushes some good to stay soaking for a few more months! So, if you are reading this the world hasn’t ended, and all that worrying was a waste of time. Well, that is not strictly true – if you are reading this, it probably means the world hasn’t ended, but it could just mean that you are reading it early and all the bangs and wailing and gnashing are yet to come. I am not taking any risks; I am posting it well before midnight on the 20th. It would be a huge pity to go to all the trouble of writing a post and not have anybody read it because there was nothing left but a few irregular shaped fragments and a little trickle of smoke where the world used to be. I note that NASA took the same view and published their report that the world wasn’t ending very early indeed. Perhaps they wanted to discourage anybody who was thinking of giving it a helping hand. Thanks to Google, I do know that there are quite a lot of you out there who are worried that this world ending stuff might actually happen. WordPress very thoughtfully provides a list of the links that bring people to the site. Back in September I wrote a jokey review of Sharon Haward’s End of the World installation which she held in her studio in Hastings; I gave it the title The end of the World is starting in Hastings now. In the intro, I wrote a bit about the Mayans as well as Harold Campion who was pretty confident, you remember, but got it wrong. Since then, by far the greatest number of hits I get on any single subject is from people who have entered sensible search terms such as “Mayan Calender end of the world.” Then, as so often happens with internet surfing, they appear to have got side tracked and ended up wanting to know just what the good citizens of Hastings had done to get advance world ending treatment. I can see now how Google is able to predict epidemics faster than hospital doctors. If people start Googling plague in large numbers, there’s a fair chance that a good number of them are a little worried about the nasty buboes that are coming up under their arms. I am not suggesting that plague is about to bring an end of the world, just that if it were to be a problem, Google would know it first. On the same principal, if you are an art investor, I would seriously consider buying an Adrian Ghenie if you can get hold of one, apart from the fact that he is very good, I get more people looking for information about him ( I wrote about the painting he did Pie Fight) than for any other artist I have mentioned. Back to the end of the world; with 21 December nearly past, I am going to miss all you worried readers. I have grown fond of you. I picture you searching the web for information, scanning the skies, looking for portents and incoming meteorites, stocking up on bottled water and baked beans. So the next three pictures are just for you; they show how the end of world might look. The first is Hell by Hieronymus Bosch and ok, it isn’t strictly the end of the world though it was for the people concerned. But doesn’t it capture the blighted post apocalyptic, desolate landscape marvellously well. This one by John Martin is your proper God smiting world end – just look at those mountains doing their business and it’s got waves. Martin”s God wasn’t taking any chances. Finally, to show it might not be so bad is this one by Sir Stanley Spencer, the Cookham Resurrection. I just love the way the resurrected dead are so relaxed, mooching about, chatting, reading grave stones and the way that some wives are brushing the dirt off their husbands and no one seems to be having a bad time at all. So if Spencer’s vision is correct it could all be all right; on the other hand if Martin is right, it might not be. So for those who like to be well prepared, here are some other dates where you might be pleased to have a few extra tins in the back of the cupboard – though if it really is the end of the world you might not have time to open them. 2016: according to Weekly World News, Professor Lloyd Cunningdale excavating the Donner Party disaster found a time capsule which had been left by a group of settlers who became trapped by snow in the Sierra Nevada Mountains in 1847. It predicted that biological warfare would kill everybody off in 2016. Why on earth a group of settlers who hadn’t been able to predict that it is bad news to get stuck in the Sierra Nevada in winter should be seen as an authority is not clear. Then it is not clear why the Mayans are meant to be an authority on the world ending either. 20 February 2020 – otherwise written as 20.02.20 Just look at it – all those twos – could be the end of the world. 13 April 2029 Apophis, an asteroid that is some 330 metres across, that is a pretty big lump of rock it is predicted to miss the world by just 18,000 miles.That sounds a bit too close for comfort. 1 April 5,000,002,012 that is when the sun is predicted to turn into a supernova, give or take a few million years; that really will be the end of the world.